New Delhi: Former India opener Virender Sehwag on Friday hosted some of the Indian stars of the the recently-concluded ICC Women’s World Cup. 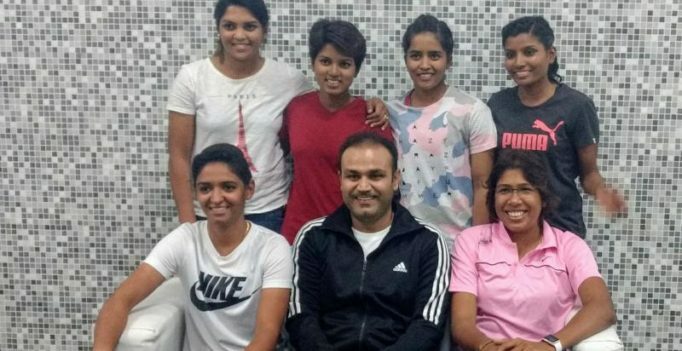 The former Delhi batsman took to Twitter to share a photo, when he met Harmanpreet Kaur, Punam Raut, Jhulan Goswami, Veda Krishnamurthy among others. Harmanpreet Kaur expressed happiness over this and thanked Sehwag for hosting them. The Mithali-Raj led Indian team had a tournament to remember as they finished as runners-up in the recently-concluded ICC Women’s World Cup in England. The Women in Blue came close to winning the title, but it was England who emerged winners by nine runs in the final at Lord’s. It was Harmanpreet’s heroics of 171 against Australia in the semifinal which helped India reach the final of the World Cup. After the tournament, the Board of Control for Cricket in India (BCCI) announced a cash prize of Rs.50 lakh for the players, while Rs. 25 lakh were rewarded to each of the supports staff. While Mithali Mithali Raj was presented with a BMW car by Telangana Badminton Association vice president V Chamundeswaranath, Harmanpreet Kaur was offered the post of Deputy Superintendent of Police by Punjab Chief Minister Amarinder Singh. On Friday, bowler Shikha Pandey was felicitated by Goa Chief Minister Manohar Parrikar.